DAD!!!! 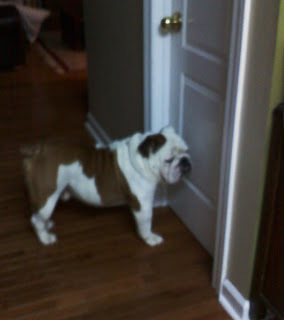 Please come out of the bathroom, I NEVER take that long!!!! Okay....when do YOU ever wait THIS long to get to GO to the bathroom??? Awwww, Apollo!!! You are so adorable! Big kisses to you, you have the most gorgeous face!! How long did it take for Dad to come out of the bathroom? LOL!!! I would love to post some new photos of Chief but he is so bouncy these days I can't get him to sit or stand still long enough to get even one that is slightly decent! LOL! This entry made my day start with a huge smile in my face! Great pictures. And a reminder to not keep our loved ones waiting to hear from us--I like the way you've woven your themes in this post. Dont you love it when you go into the bathroom and they 'hound' ..you to get inside. 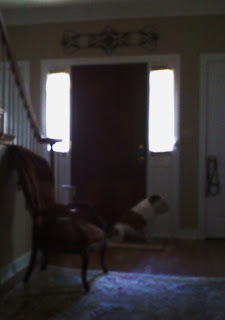 :) Like there is another door you might slip out of .. LOL I can usually tell when DH is in the Bathroom as Annie is laying outside it..waiting. Loved these photos. Always love your photo stories!! Beautifully thought out and put over. what is it with humans? 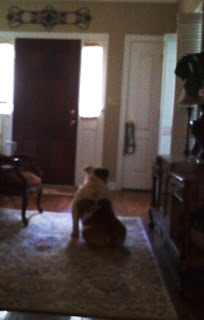 they are always shutting doors in our faces, aren't they? why can't we go to the bathroom with them? what do they do in there? do you know apollo, because I don't!